Do sled dogs always wear shoes? Learn something new everyday! Beautiful pic! Dog booties keep dog's feet from being damaged from rough trail conditions. Ice and snow can get between the dog's toes and cause injuries. That has to be one of her 'beautiful' moments from his year's event. Sadly, she lost her team (or they left her behind!) several times, and she decided enough was enough yesterday afternoon. She is not alone.....many have quit already with broken legs, ankles, sleds, and egos. The dogs? They are all doing well! Sounds like a brutal race this year. The snow gets between the dog's toes and sticks to the hairs. Because dogs expel their excess body heat through their feet, that snow will melt and refreeze forming ice-balls, depending on the dog's activity. Which, as hogfamily pointed out, can cause injuries or at the very least discomfort. Hampering the dog's performance. When they are running the ice-balls between the dog's toes is not that big of a concern, but when they stop running, or slow down to just a walk, then that is when the ice-balls will form. Where along the trail were you for this? Corral Hill is about 10 miles down the Corral Hill Trail going east from the restart. 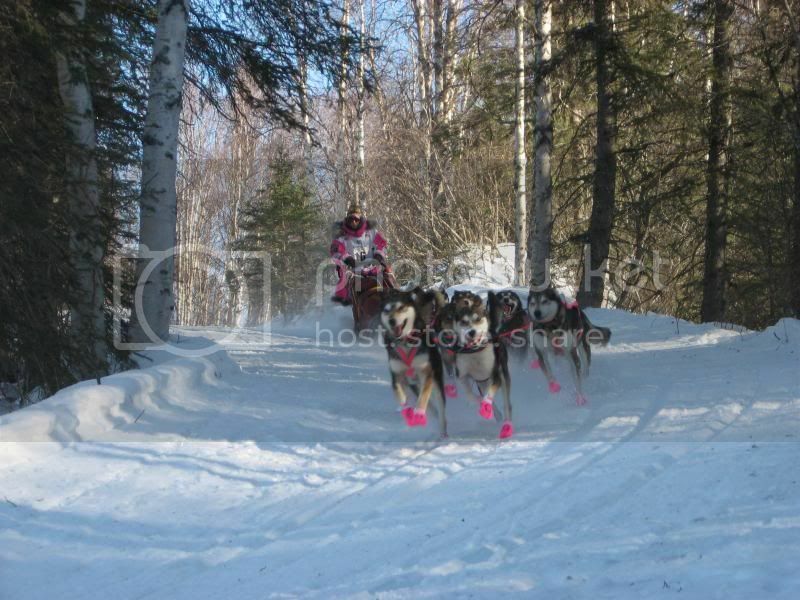 We get there by going through the Deshka Landing then down the Susitna River about three miles. The photos at the flatter area are the Susitna River about a mile down river from Corral Hill. So the only way to get to that area is by snowmachine. I don't have one and the area I always go to is Long Lake but am getting bored with it plus there is too many people. I'd like to find somewhere accessible by car that is less populated.